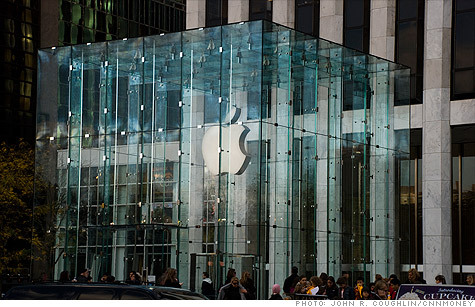 NEW YORK (CNNMoney) -- Apple is a force to be reckoned with when it comes to the supply chain for gadgets. It gives buyers what they want faster than its rivals -- and in the process, it sometimes delays the competition's products from coming to market. Japan's earthquake, tsunami and aftershocks halted or slowed production of hundreds of components that are found in consumer electronics devices, including the iPhone and iPad. Memory chips, touch screens, image sensors, batteries and the special resins that are used to hold chipsets together have all been in scarce supply lately. Yet Apple (AAPL, Fortune 500) sold a remarkable 18.7 million iPhones and 4.7 million iPads last quarter. COO Tim Cook said Wednesday that the company would suffer "no material supply impact" in the current quarter, despite what he called "the mother of all backlogs" thanks to very strong demand for the iPad. Other consumer electronics makers haven't been so lucky. Sony Ericsson, for instance, said it would delay its eagerly anticipated Xperia Play "PlayStation phone" because of the Japan earthquake's impact on the supply chain. Research In Motion (RIMM) finally launched its PlayBook tablet last week, after delaying its release by a month. "A number of equipment manufacturers are getting delayed or shut out due to Apple's supply chain dominance," said Brian White, supply chain and Apple analyst at Ticonderoga Securities. Not only has Apple been able to beat competitors to the market with devices, it also sells them more cheaply. Despite having a year to catch up, no major tablet competitors have been able to match Apple's $499 entry point for the iPad. "The products are hot, it's got $60 billion in cash, and it's a big company," White said. "Those three factors allow it to get more of its fair share of components, and ultimately market share." Apple aggressively uses its size and vast array of resources -- including its very deep pockets -- to get the deals it wants with component makers. The company sent executives to its Japanese suppliers literally with cash in hand to make sure supply remained adequate, White said. But Apple's key to supply-chain success isn't as simple as its ability to bring bigger briefcases of $100 bills to its partners than its rivals. Part of the reason Apple wins in the supply chain is simply because Apple is so successful overall. "In times of a shortage, suppliers are going to sell to their biggest customers first," said Tom Dinges, senior electronics manufacturing consultant at IHS iSuppli. Sales of Apple's devices have risen astronomically over the past several years, and the company has grown to become one of the world's biggest component purchasers. But there are lots of big companies out there. What separates Apple from the rest is its ability to sell a lot of products while selling remarkably few different kinds of products. Apple predominately sells just five different gadgets -- iPad, iPhone, iPod, Mac and Apple TV -- and a combined total of 15 different variations of those devices, excluding modifications like the amount of available memory. That small handful of products shares many parts common to all the devices. That makes Apple's supply chain among the most precisely honed in the world. "For a company of Apple's size, no one out there sells so few different products," Dinges said. "As a result, Apple's sourcing strategy can be much more finely tuned than other companies with very disparate products." All of that adds up to a very well-oiled machine. Despite ongoing worldwide supply constraints, Apple's Cook said the company is "so confident in its ability to supply" that it's launching the iPad 2 in 13 more countries next week. The Motorola (MMI) Xoom isn't even available in 13 countries yet.